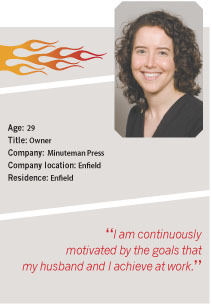 We are excited to announce that Lindsey was selected as a Hartford Business Journal 40 Under Forty recipient in 2008. We have posted Lindsey’s responses to the 40 Under Forty questionnaire below. A PDFof some of the section is available for you to view as well. Career highlights: I was working as an Assistant Buyer for Filene’s in Boston, and my husband Michael was a middleware engineer for a tech company in Cambridge. His parents, owners of Minuteman Press of Norwich, heard that Minuteman Press of Enfield was for sale. They casually mentioned the opportunity to us, and we decided to explore it. We were both ready to make career moves. My marketing education and my husband’s IT education have helped us stay on the cutting-edge of printing and grow our business. I focus on outside sales and Michael is our production manager. Community involvement: I serve my community through local organizations such as the Rotary Club and the Enfield Food Shelf. It is because of the support in the community that my business has grown, and volunteering is one way to give back and show appreciation. Being involved ties me into my community. It provides me with the opportunity to strengthen the area in which I live and work. If we strengthen our communities, we will all benefit as individuals and business people. Only good things can come from giving back. Volunteering also serves as a strong reminder of my good fortune. Biggest success: I am continuously motivated by the goals that my husband and I achieve at work. Our biggest achievement so far was surpassing our sales goal in July and increasing revenue 74% over last July. It was an incredible feeling. We attribute the growth to a good balance of sales calls, networking, and community involvement. Dream job: Having the personal means to begin a philanthropic organization and spend every day making a big impact in the world. Businessperson she most admires and why: The members of my Rotary club are full of wisdom and knowledge, and I look at all of them with admiration. They have had many more life experiences than I’ve had, and they have a lot to teach. I have learned something from each and every one of them. They conduct business with integrity and honesty, and they also have a strong sense of community.